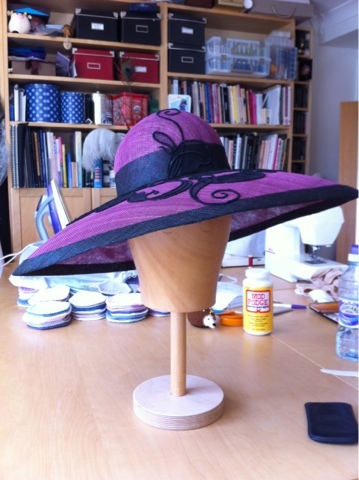 When people come to my workroom to try on a dress or a hat, or talk about commissioning something it really doesn't look like it does on an average day when I am making things. When other people are about the room is tidy and organised, the tables are folded down small (marvelous design from IKEA halves in size) and as much as possible is moved into my bedroom to make it appear bigger and give more space. When I am working however, it quickly clogs up with all sort of things, from feathers to patterns, not to mention various sewing machines and hat blocks. One of my friends was saying she would like to see my workroom (and have a play! ), so I thought I would take some pictures.... I've tried to be fairly honest and not tidy up so that this is what it does look like for most of the time- semi organised mess! From this angle you can see the hanging rail that my Dad fixed up for me. 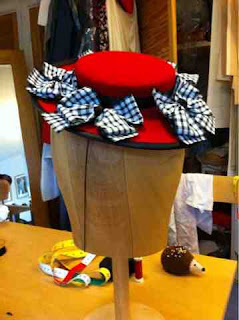 It currently has a load of costumes and dresses on it. It also contains all the card pattern blocks I have drawn over the years- so useful in creating new designs. My new red kettle is sitting on it's hot plate, along with one of my full size irons and my mini iron, which is sitting in a mug to stop it burning the table top. My super embroidery machine is on a movable table in front of the window where it gets the best light. I try and keep it covered to prevent dust getting into it. Next to it is a movable set of drawers with lots of my embroidery threads on the top and loads of interfacing and fabric inside. The shelves are totally crammed full of books and boxes of all sorts of things. The two big boxes with handles on the top shelf contain a vast number of threads. My books are probably my most important possessions along with my sewing machines. When I'm feeling ill I spend a lot of time reading and my rather large collection of fashion history and costume is invaluable in keeping me sane and inspiring new projects. They are is a sort of order, divided into historical books,dress making books, hat books and specific areas like corsetry or pattern cutting. 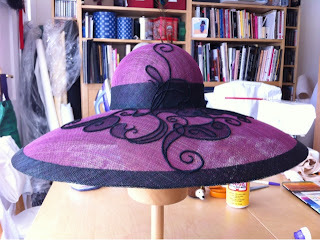 The boater is one of the simplest and widely used hat forms. According to Wikipedia, fountain of all knowledge, 'It is normally made of stiff sennit straw and has a stiff flat crown and brim, typically with a solid or striped grossgrain ribbon round the crown'. This may be where it started, but the boater has found fame in a huge number of incarnations from ladies elegant head wear, through barber shop quartet accessory, to school uniform staple. This probably explains in part why the boater has so many different names, boater, basher, cady, can-can hat, Katie, Somer, sennit hat, or my personal favorite the 42nd street skimmer, according to P. G. Wodehouse! I found a very charming version on the Metropolitan Museum Collection website, where I often spend a happy hour browsing through their fantastic costume and fashion collection. 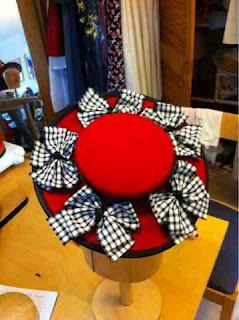 This version was a small red perching version, with black bow decoration made by Bergdorf Goodman in 1944. 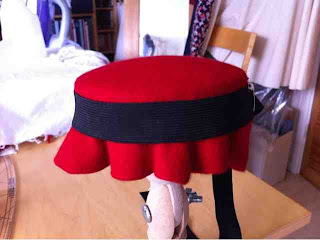 It's a great example of the popular fashion of the 1930's and 40's for men's hat styles to be made in miniature for ladies I had a red felt hood handy and a small round block to use for the crown. I don't have any small brim blocks (yet! 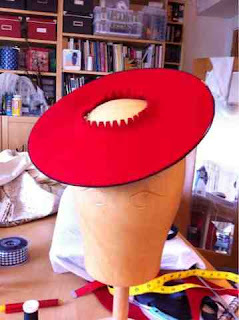 ), so I thought I would try using my tailors ham to block some shape into a flat felt circle for the brim (a tailors ham is a heavily stuffed shape that tailors use to press curves into collars etc). I got a bit snap happy whilst making it, as I thought it would be nice to see the process of making as well as the end product, and to show how much work goes into each hat. 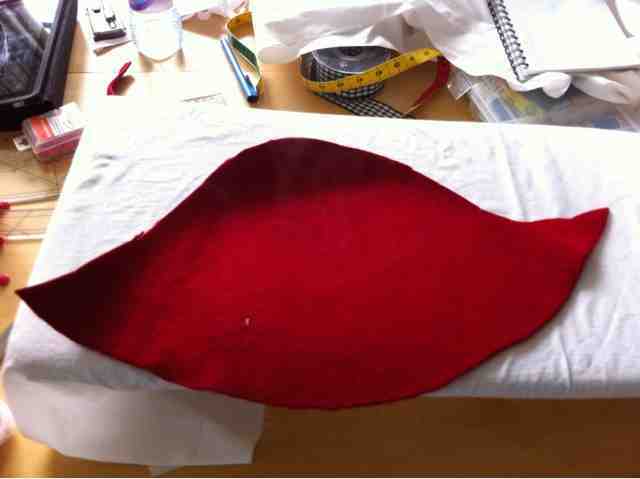 Having given the hood a really good steam I started pulling it into shape over the block. As its a small block I cut the excess off the hood to use as the brim and to make it easier to pull round the block. I needed to re-steam the shape, as the felt becomes less malleable as it cools, so I removed the felt from the block and held it back in the steam then popped it back on the block and used a wide piece of elastic to hold the shape I'd already blocked whilst I dealt with the fold the felt around the bottom of the block. Once I'd got all the felt pinned under I left the crown to dry overnight and marked the base line of the crown with chalk where I cut off the excess. 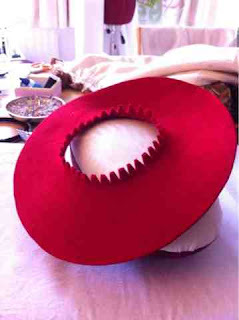 This is the other half of the hood, which I had to press flat first, then cut out the circle for the brim. 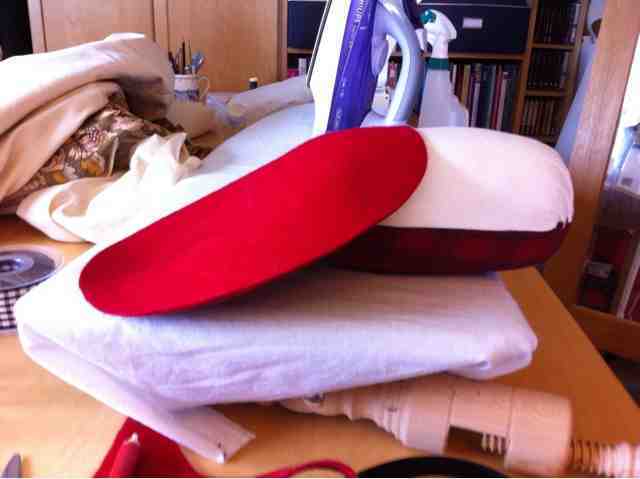 To help get the steam into the felt I used a damp tea towel and an iron to press it over my tailors ham. 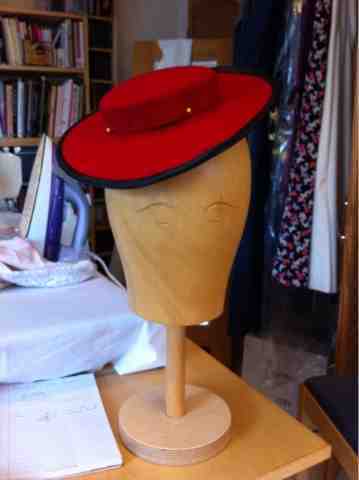 I wanted to make it slightly down turned at the front and up turned at the back. 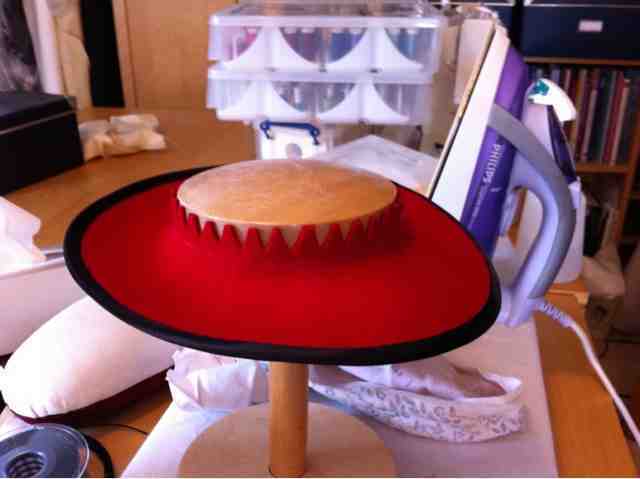 To attach the crown and brim together, I cut a central circle out of the brim with a small seam allowance which I clipped and pressed upwards. ...which I then covered with black satin bias binding. To help keep the opening in the middle standing up I used the crown block and a bit more steam to mold the felt into place. I pinned it all together to check that it all fitted together and looked good. 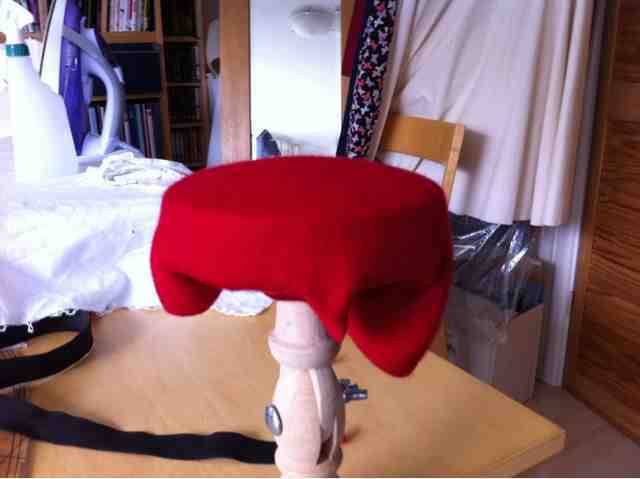 Having sewn the brim and crown together (stabbing myself frequently in the process-oops), The inside of the hat is finished with a petersham ribbon and a length of elastic to hold it on the head. 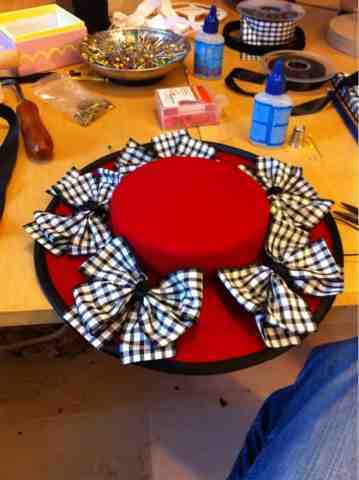 The best part of hat making is putting the decoration on! I really like these pinwheel bows made from gingham ribbon. 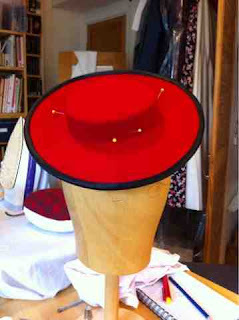 From this angle you can see the shaping of the brim. I'm very pleased with how it turned out. 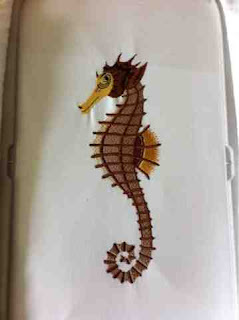 Continuing my rather odd obsession with animals wearing hats, I decided to add some headgear to a seahorse. 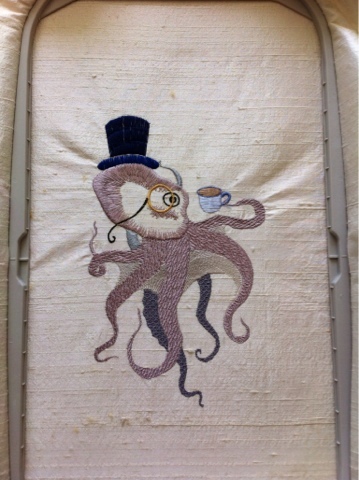 Along with my octopus design, I should perhaps do a shrimp or a lobster, and I'll have a positive underwater tea party! 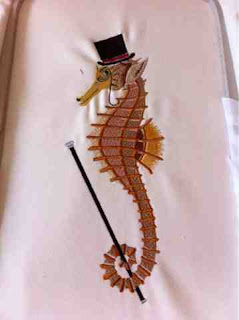 I started by digitising a normal seahorse and after a trial run of that I added the top hat, monocle and cane. 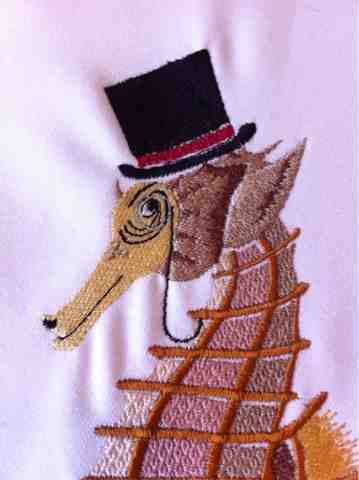 I'm rather pleased by how the sea horses expression came out and with a few more tweaks it will be ready for sewing onto cushions and bags and anything else I may fancy. 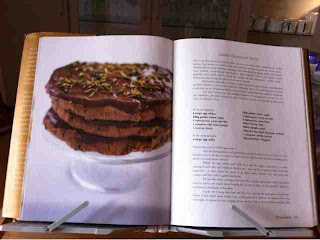 I'm sure its pretty obvious from the recipes I post on here that I have a sweet tooth... But I have to admit that meringues and meringue based recipes are my absolute Achilles heel. I just love them! It may partly by that one of my earliest memories is of my mum making us meringues sandwiched together with whipped cream (droooooooool!) 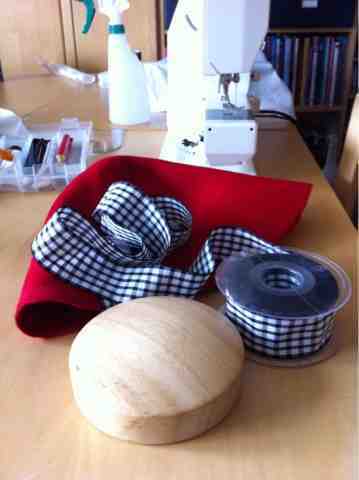 or that they are so simple to make and yet can be so wonderfully different just by tweaking what you do with it. 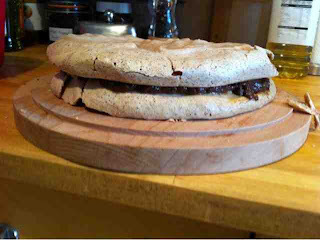 Considering this it is amazing that I have not got round to make Nigellas Gooey chocolate stack sooner, as it is a pile of chocolate meringue discs sandwiched together with chocolate creme patisseiere-what more could you want? Just the picture in How to be a domestic goddess is enough to make my tummy rumble. Then if you look at the ingredients it just gets even better, 6 eggs, vats of chocolate and sugar and double cream to complete the calorie fest. 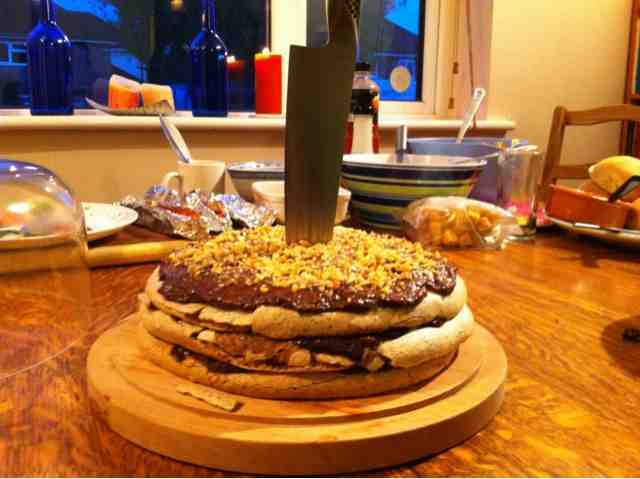 So a friends BBQ was an obvious opportunity to fulfuill this lamentable lapse. Having a Kitchenaid for making meringue makes life so much easier for me, as I can just slosh the egg whites in and get it to whisk them up whilst I sit and watch- much better then standing and holding a hand whisk. 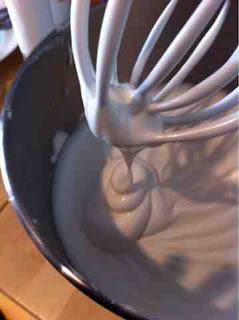 There are six egg whites in this so it does take a lot of whisking, and it really is better to hang fire with adding the sugar until you are sure the egg whites are really whisked and stiff. 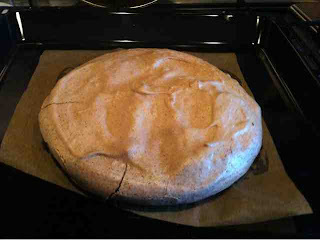 I must admit to being a terribly impatient cook and am guilty of not whisking enough at this point, which usually results in rather dense, small meringues that don't rise, not the end of the world but not what I want. I did deviate from Nigella a bit in this recipe, I used Cream of tartar to stabilise my egg white foam, not red wine vinegar, mainly because I didn't have any of the vinegar and also that's how I've always made meringue and it has not let me down yet! 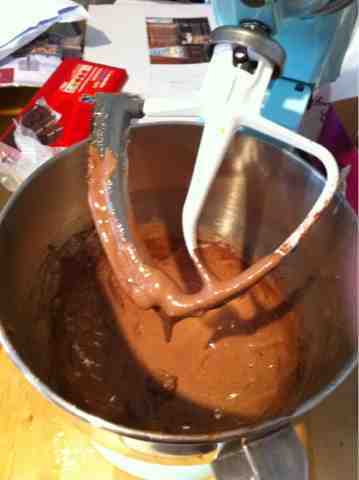 Not quite whisked enough yet, but getting there. 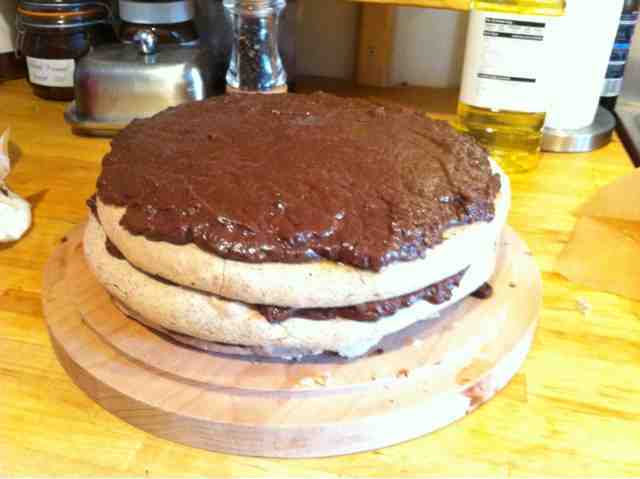 Once you've made your basic meringue you carefully fold in cocoa powder to make it chocolatey then spread it out on three baking sheets. As suggested by Nigella, it is best to draw circles on the baking parchment so you get them the same size, otherwise your stack may look a little weird! 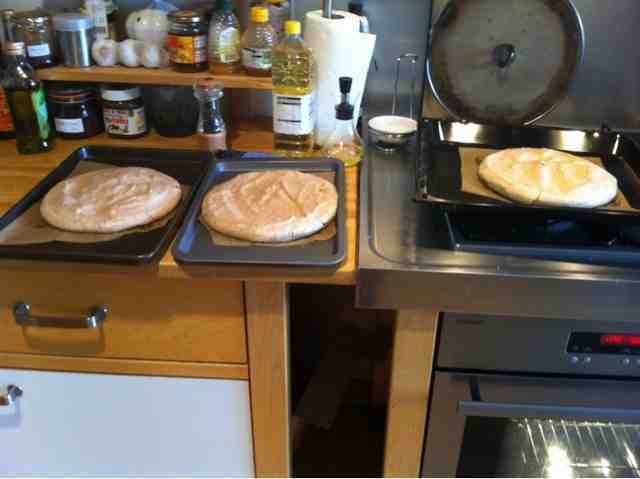 These then get baked for an hour and left to cool, so far, so simple. The Chocolate Creme Patissiere (or pastry cream) was a bit more complex. 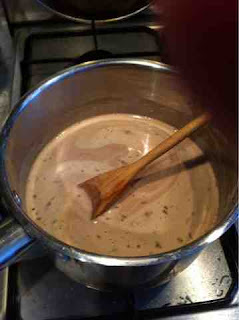 I've not tried this type of thickened custard before and although it was not as complex as I thought it was going to be, I may have rushed it a bit so mine was not as totally smooth as Nigella's looked. 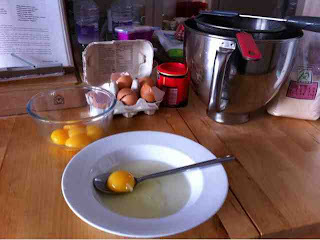 It is made by beating together egg yolks and sugar, then pouring a mix of warm cream and milk onto these whilst whisking. The cream and milk must be warm but not too hot, or it will start cooking the egg yolk and they will scramble as you stir-not good! 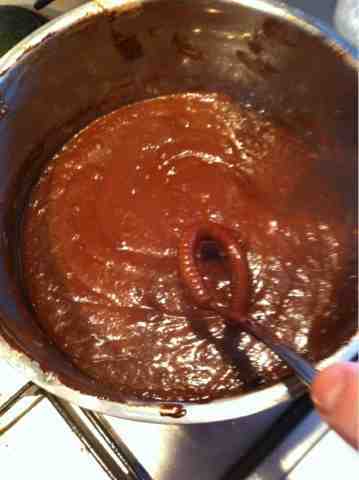 This mixture is then returned to the heat and brought to the boil whilst constantly stirring to prevent lumps then allowed to cool, then any additional flavours are stirred in, in this case melted chocolate and vanilla essence. I managed this all quite well with the help of Mr EB, but on my own I could easily see that I might spill lots of things everywhere. It turned out very chocolatey and shiny and tasted great, even if it was not entirely smooth. The cake is put together in layers of alternating meringue and pastry cream and then I finished mine with toasted hazelnuts. 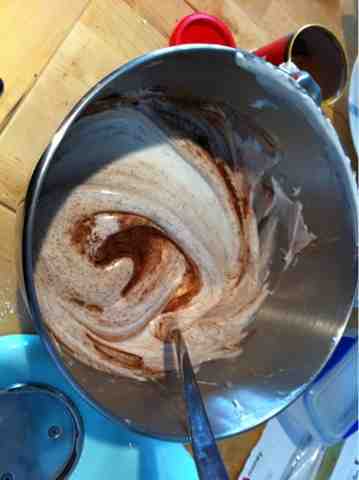 It was yum, a lovely mix of gooey chocolate cream and crispy meringue... And got eaten very quickly at the BBQ! Goodness two posts in s many days! How unlike me... This is due to my finally finishing the hat I've been working on for ages and some of the embroidery I was doing during the IVs I finished on Friday. 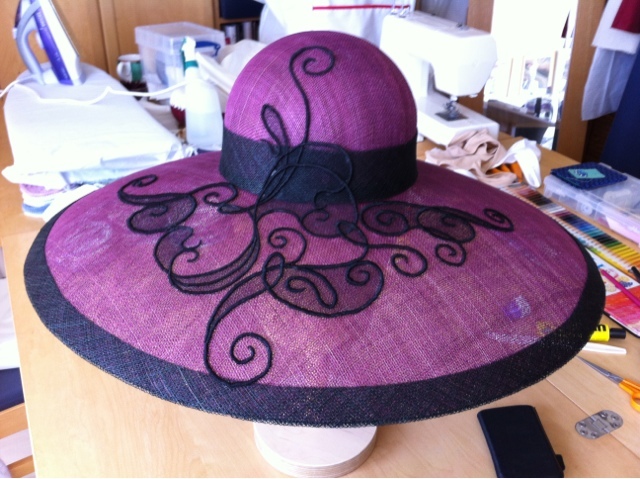 This time I've used my new embroidery capability to add decoration to the hat I had waiting for decoration (see this post for the making of the hat). I've always doodled curls and scrolls all over the place and it's something I've been making lots of embroiderys of recently, I just never thought to put them on a hat until now. 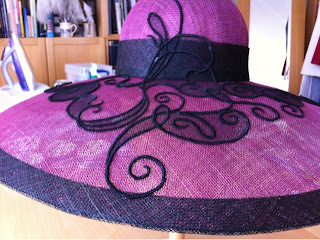 I had tried lots of different decorations for this hat, including feathers, lace and sinamay flowers, but had not found one I was happy with. But with my marvelous new machine it seemed a perfect opportunity to use all these designs. 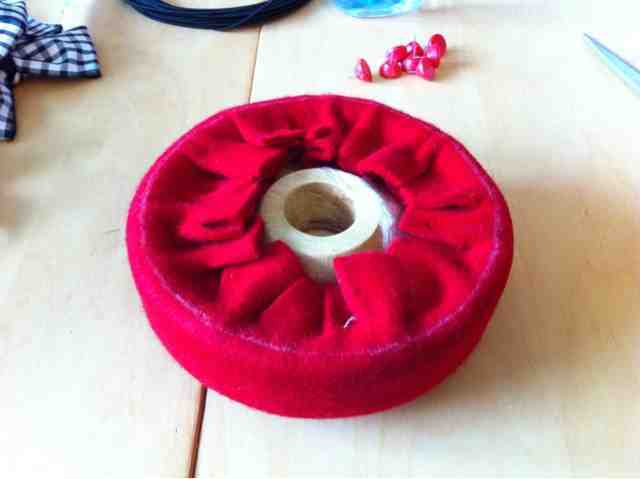 I first embroidered the scrolls onto black tulle using with dissolvable stabiliser to help support it. Once they were complete I cut away the excess tulle and washed away the stabiliser to leave the freestanding scrolls. There are four separate motifs that I sewed and glued onto the hat. 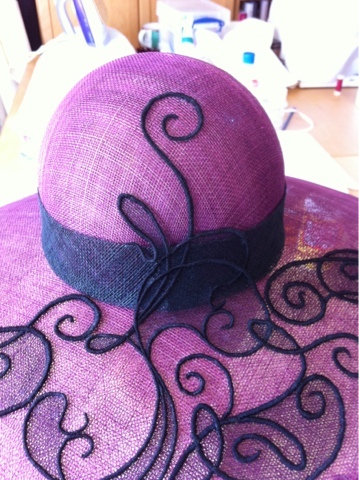 I think the decoration doesn't distract from the elegant lines of the actual hat and it also covers the join in the hat band rather cunningly. 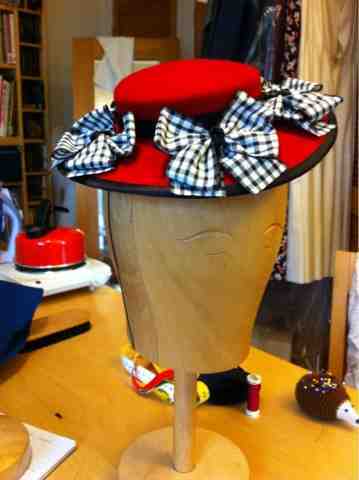 Now I just need a good occasion to wear it to! How messy is my workroom! Sadly my old computer went phut a few months ago and with it went my embroidery software. When we upgraded the family computer I tried to reinstall it on the new machine. It was having none of it. I still had the original disc and my licence number, but the website that would have verified it and allowed the instillation no longer exists. When Elna was bought out by Janome a few years back, they did not carry on the support for my machine because it was no longer in production. I tried everything to get it to install, and then got Mr EB to try an awful lot more that I certainly did not understand. The upshot was that there was no way to get the software onto the new machine without doing stuff that was not strictly legal and was immensely complicated. 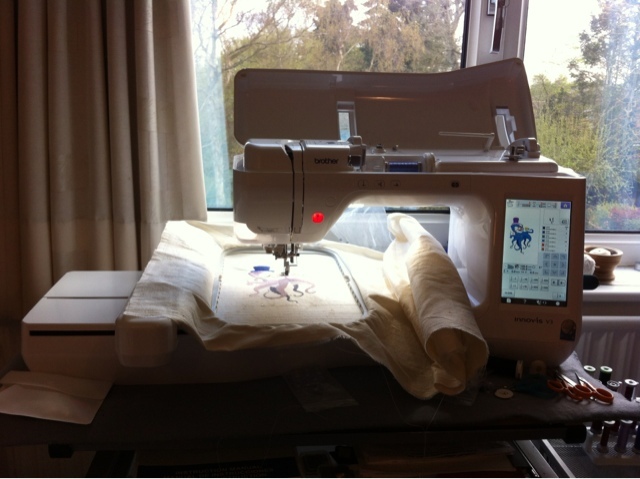 I must admit to being incredibly annoyed about this, I spent a heck of a lot of money on my machine and software so to be given no help whatsoever by either Janome or Elna -despite repeated contact with both, did not endear me to either company. 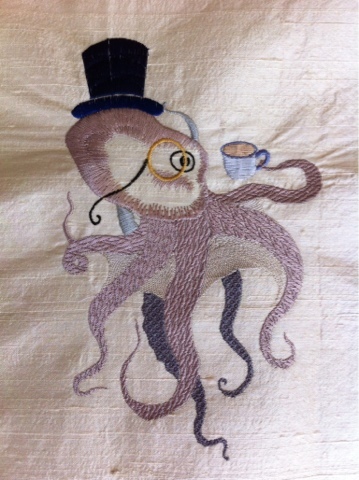 My capability to design new embroidery had basically been removed through no fault of my own and I could not use my fully paid for, legal copy of the software. In the end the only option was to buy a new set of machine and software, but I was definitely not going to go for a Janome as I was particularly annoyed with them. In the end I went to the marvellous Sew Creative centre in Bury St Edmunds to chat with their embroidery machine expert Elaine. She was totally brilliant! She did not try and recommend the really expensive machines but actually took the time to find out what other machines I already have and what capabilities I was particularly interested in. In the end I opted for a Brother Innov-is V3 embroidery machine. 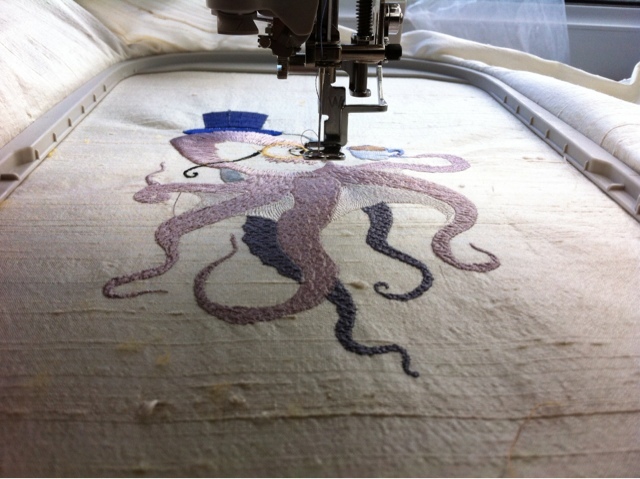 My Elna still works perfectly as a sewing machine, with all its fancy buttonholes, stitches etc, so there was no point in spending an extra couple of grand to get another machine that would both embroider and sew, which would duplicate these capabilities. Because Elaine suggested this embroidery only idea, I saved a lot of money-hurrah! I also was unaware that Brother incorporate a lot of the complex extras from their professional multi-head embroidery machines into their smaller, home based models. Again, I had no idea about this, so thanks to Elaine's expertise and experience with lots of different machines I think I came away with the best machine for my needs and so far I cannot fault it in any way! I am really pleased with how it turned out. 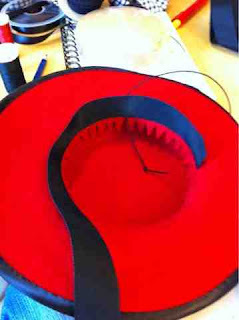 The machine sews so quickly and quietly it only took about 45mins to complete it. I tried to use some of the new special effects the Brother has, all the different programmable fills are great. 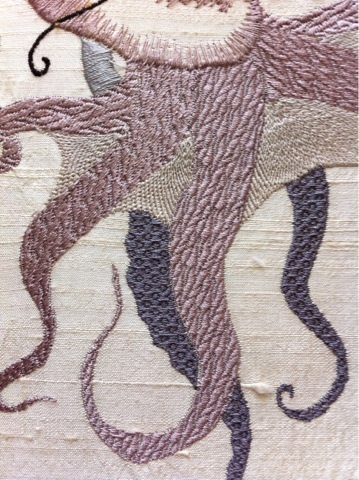 I used different ones for the various legs and radial stitches for the joins between the legs. They look really good if I say so myself!